If you're in a climate like Chicago, you probably don't need those spring clothes cropping up in stores just yet. We have a month, max 3 of chilly temperatures left. I am sick of my winter clothes but unless I want to freeze I'll need to keep wearing them a wee bit longer. 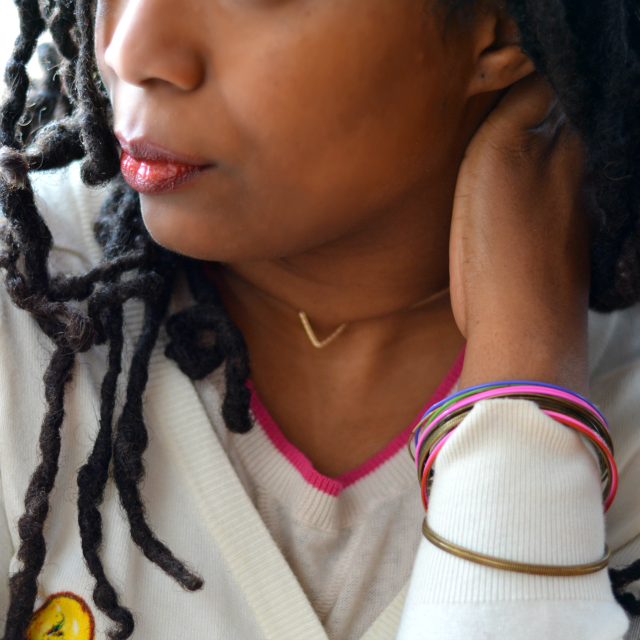 I can however transition to spring with a few inexpensive pieces that I can wear now and after the thaw. Wear brightly colored skirt that contrasts with your cozy warm layers. 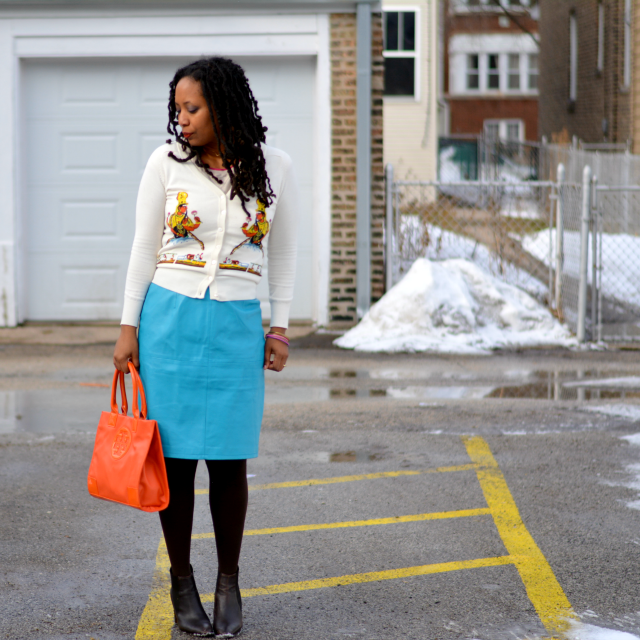 Colored skirts of yesteryear are plenty at thrift stores. If florals are your thing, your transition pieces are definitely here. 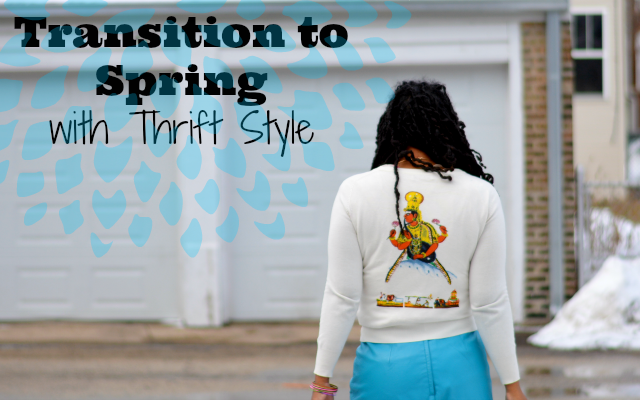 Thrift stores transition to spring / summer attire too but it's still an abundant source for all seasons at the same time. If you score a skirt with a thinner fabric, you can still winterize with thick tights, boots, and a heavy coat while you're waiting for warmer weather. If you're not quite ready to dive into the color explosion, keep it simple with a splash of neon trim or a subtle yet bold graphic to wear with the cold weather staple -- jeans. Pile on an arm party of colored bangles and think happy thoughts of spring flowers blooming. Estate sales are great for random cute jewelry. From painted bangles to vintage rhinestone jewelry you can find unique pieces to brighten up the winter wardrobe you may still be wearing. Add a pop of color with a new bag. 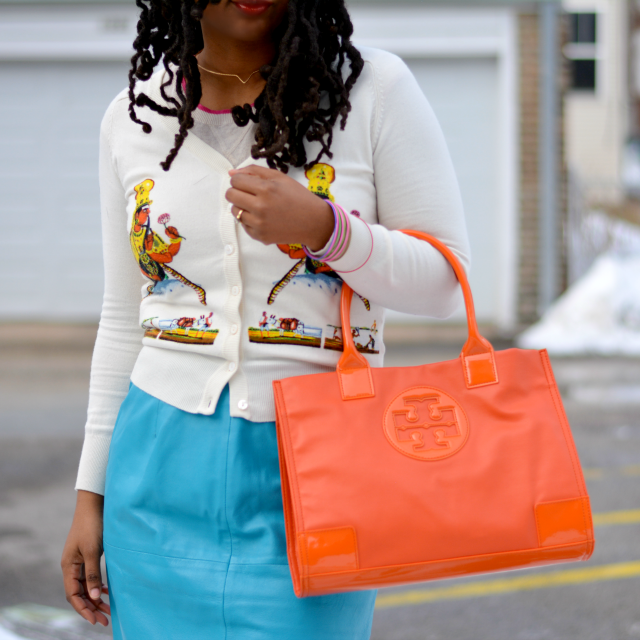 Nothing says spring like a vibrant colored bag. Does it get any better than orange? *heckles self with chants of purple* It's such a mood enhancer. It's the perfect color when you're wearing a neutral color palette or in my case wanted even more color! Sadly, this Tory Burch Ella tote isn't mine. A friend asked me to consign it in The Thriftanista Closet. It's new. It's for sale. It's 35% off retail. How are you transitioning to spring? 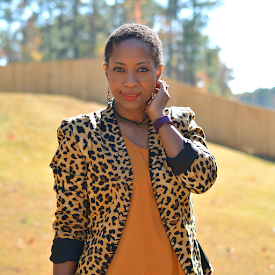 Linking up with the lovely ladies of Monday Mingle, Thrifters Anonymous, Nic's Style Me Monday, and What I Wore Wednesday. 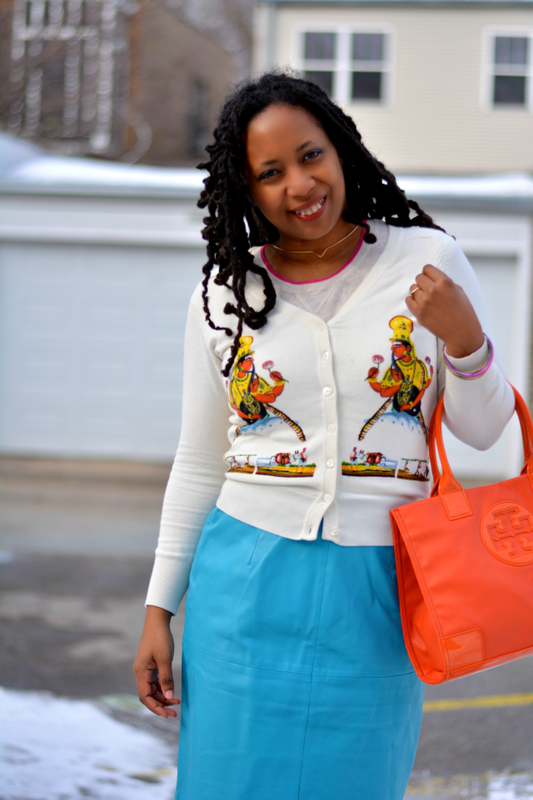 Subscribe to Thriftanista in the City newsletter and I will thrift for you! Love the look, and transition items/tips! That tote is just so darn FABULOUS!! I looooove that leather skirt! The color is fabulous on you. I am very slowly adding color to my winter clothes. I seriously need Spring to happen NOW. Love the skirt and sweater! Too cute! Luv, luv, luv this get up!! Those bright colors will certainly help thaw the chill! Very cute Troy! I love how you styled this! The colors are amazing! Definitely get me in the mood for spring! Well put together. I love the cardigan!!! I love the cardigan. I love cardigans. They kinda like me too. The cardigan is so unique I can't believe someone didn't like it anymore. Super cute look! 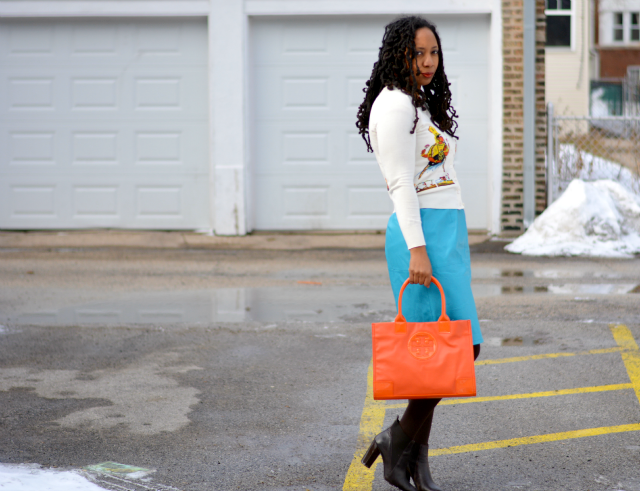 I love the blue leather skirt and the orange bag, and the cardigan is awesome. Love the print! Great look. My eye was immediately drawn to your orange bag. Such a vibrant color and it just POPs against your clothes. Yes, this is a great transitional outfit! Hopped over from Thrifters Anonymous! Nice to see you again, this time I hopped over from What to Wear to Work with Whitney! I love a pop of neon! What a one of a kind find, that sweater is so cool. That cardigan is friggin' awesome...love it! I came from What to Wear to Work with Whitney. I ADORE all the bright colors...that skirt and that BAG!!! Looks fabulous! Thanks for linking up with Monday Mingle. Great reminders, Troy. Thank you.